Battleground Chicago: The Police and the 1968 Democratic National Convention ReviewWhy all the violence at the 1968 Democratic National Convention in Chicago? The official government inquiry said it was a "police riot"--individually and collectively, the Chicago police lost their professional control and engaged in mob violence. True? Or were the cops just following orders? Or were they provoked into a violent reaction by physical and verbal violence from the antiwar activists and agitators? 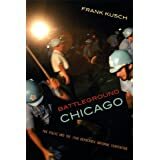 Kusch interviewed dozens of retired Chicago police officers who were on the streets and in the parks of Chicago back in August of 1968. He tries to understand their thinking and emotions, tries to untangle their motivations and reactions. Ultimately he gives a well-argued, complex answer to that persistent question: why the violence? Want to learn more information about Battleground Chicago: The Police and the 1968 Democratic National Convention?